NOTE: About a year a half ago, I published a 3-part blog tracing the fascinating history of STAR TREK CONTINUES. In honor of their penultimate episode being released this past week and their series finale next month, I will be reprinting these blogs and adding an additional blog or two covering what happened between then and now. Those were the last two words uttered by Captain Kirk before Star Trek the original series was canceled in 1969. TOS fans always felt a pang of frustration that the five-year mission of the USS Enterprise was cut short after only three years in space (and on the air). Sure, in 1973 an 1974, we got to see 22 animated episodes of the series, voiced by the same original actors, but we never got to see the end of that five-year mission. Even when Star Trek crossed over into motion pictures, the end of Kirk’s first mission was still a mystery. 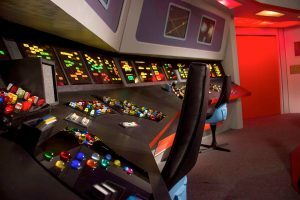 And the days of seeing those those bright red, blue, and gold uniforms and those amazingly colorful starship Enterprise sets—those days were gone forever…except in reruns, of course. I used to have this dream where I was watching an episode of TOS that I’d never seen before. Of course, I’d seen every episode dozens of times, so when I woke up, I’d sadly remember that there were no “lost” episodes of TOS. 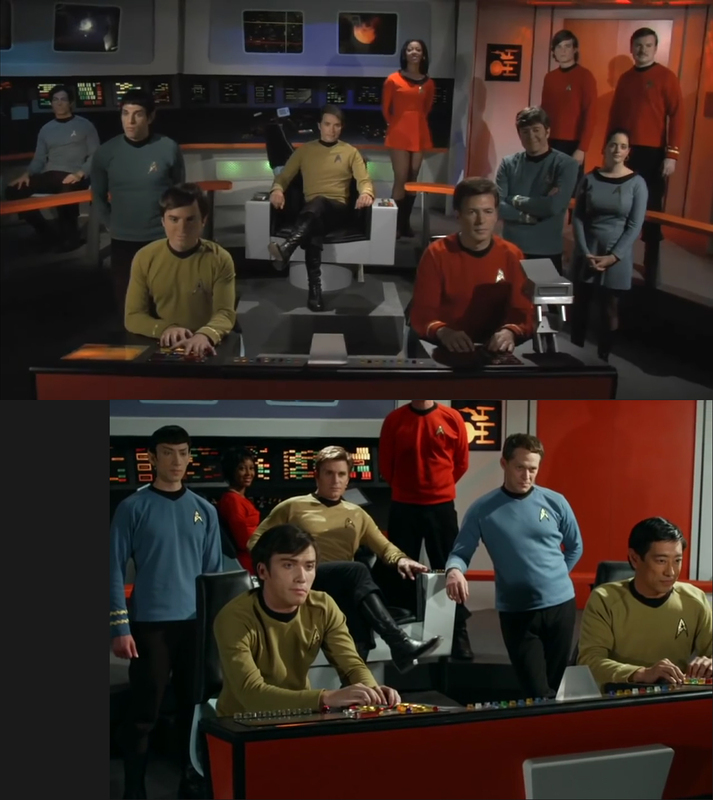 STAR TREK: NEW VOYAGES/PHASE II (top) had a wide-screen 16×9 aspect ratio. 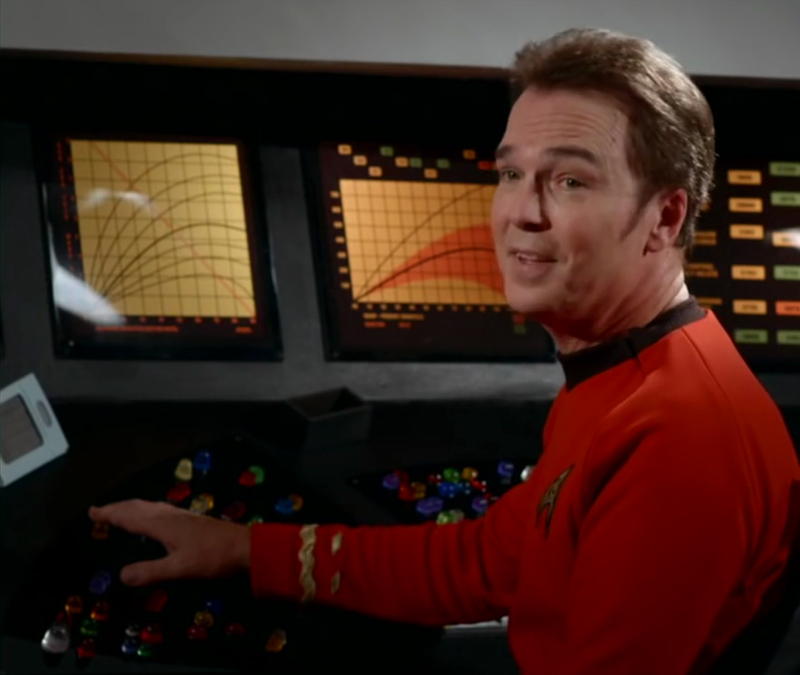 STAR TREK CONTINUES opted for a 4×3 aspect ratio. The most notable difference between the two productions—aside from the actors—was that NV/P2 decided to film in a widescreen 16×9 aspect ratio format, giving their series a more modern look. And their VFX shots of the Enterprise included new angles and movements not previously seen in the original series. STC, meanwhile, opted for a more classic 4×3 aspect format, intending for their episodes to feel almost exactly like the original series. 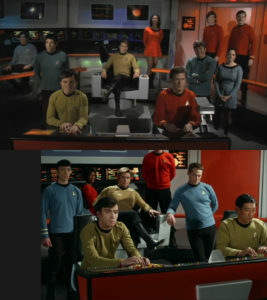 To that end, they also kept their VFX angles of the Enterprise similar to those seen in the 1960s episodes. Chris Doohan, son of James Doohan, reprises his father’s iconic role of Scotty on STAR TREK CONTINUES. The other notable difference between the two series, and one of the things that most excited fans like me, was that CHRIS DOOHAN, the son of TOS actor JAMES “Scotty” DOOHAN, would be reprising his father’s role (and Scottish brogue). Although NV/P2 had featured a wide range of TOS and sci-fi actors as special guest stars (including Walter Koenig, George Takei, Grace Lee Whitney, and Denise Crosby), they would appear in single episodes rather than being a part of the regular cast. None of this is meant to diminish the spectacular accomplishments of New Voyages/Phase 2. 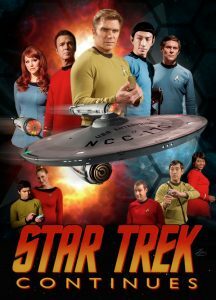 By the time that Star Trek Continues premiered their first full episode in May of 2013, NV/P2 had already released EIGHT full-length episodes, with even more in production! So in many ways, STC was standing on the shoulders of a giant. Anyway, there I was in 2013, watching this brand new fan series and thinking it was pretty impressive…much like NV/P2. It looked fantastic—nicely lit, well-fitting costumes, good hair and make-up, decent acting, and of course, amazing sets. But it still felt like a fan film. That’s not to say it was bad. It was excellent! But fan films usually don’t reach the threshold of looking or feeling like the real thing. Even at its best, NV/P2 didn’t make me feel as though I were watching an actual “lost” episode. And for the first half hour, “Pilgrim of Eternity” didn’t really give me that feeling either…and to be honest, I wasn’t really expecting it to. The moment lasted only about a minute and a half, but there it was: that feeling! It was the same feeling I’d had as a kid watching a TOS episode for the first time! It was, quite literally, the feeling I’d been dreaming about for decades. At the midway point of the episode, where the god Apollo suddenly strengthens and turns his powers on Kirk, in that moment I suddenly forgot I was watching a “fan” film and immersed myself in the belief that I was watching a never-before-discovered episode of the original Star Trek! Of course, I knew in my head that the actors were different (except for Apollo). But in that moment when I heard Apollo’s voice reverberate, saw Kirk tossed into the air like a rag doll, and listened to that familiar music, it didn’t matter that it wasn’t William Shatner hitting the floor and being levitated. In those 90 seconds, in my heart, I was watching “pure” Star Trek. Vic put in both his own money and secured financial backing from Dracogen Strategic Investments in late 2011, allowing Farragut Films to move into a much larger studio in Kingsland, GA. This additional studio space and influx of capital gave Farragut Films the opportunity to expand their sets to include nearly every USS Enterprise interior that existed at Desilu studios back in the 1960s (except Engineering). The full story of Farragut and STC can be read in this blog post from February, 2016. It was obvious almost from the beginning that the acting was of a higher caliber than that of many other fan productions. Not to put down other fan films, but Vic Mignogna, himself a well-known voice-over actor, insisted on bringing in others with acting backgrounds…and it showed. These weren’t Emmy-winning Hollywood celebrities, of course, but they were more polished and professional than the typical amateur fans who populated most fan films. But it didn’t stop there. Vic will be among the first to tell people who enjoy STC that the series owes its success to a lot more people than just him and the folks in front of the camera. STC is composed of a dedicated team (made up of both fans and industry veterans) who do professional-level work out of a love for this legendary franchise. I could spend several blogs just talking about the many individuals who make STC possible, but I want to shine a special light (pun intended) on Director of Photography Matt Bucy…to give you an idea of why it is that STC looks so close to the original Star Trek series. A resident of Vermont, this self-taught cinematographer had to fly down to Kingsland, GA for each episode to work his magic on STC (Matt is also a recreational pilot, but I suspect he flew commercial to get to Georgia). And part of that magic was lighting the STC sets the EXACT same way that the original sets were lit. You might be thinking, “Oh, that sounds so easy!” You’d be wrong. 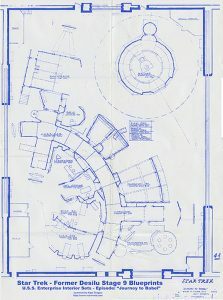 If you look around the Internet, you can find a lot of overhead diagrams showing how the original sound stage was laid out. But those diagrams weren’t full blueprints and lacked accurate measurements. Matt Bucy fixed that. In fact, in planning out the exact measurements of the corridors to the inch, Matt was able to extrapolate how high to build the spires that extend above the sets to hold the lights. Interestingly, doing the analysis of the lighting from the original series helped inform the architecture of the STC sets, and building the sets in turn helped determine the lighting. 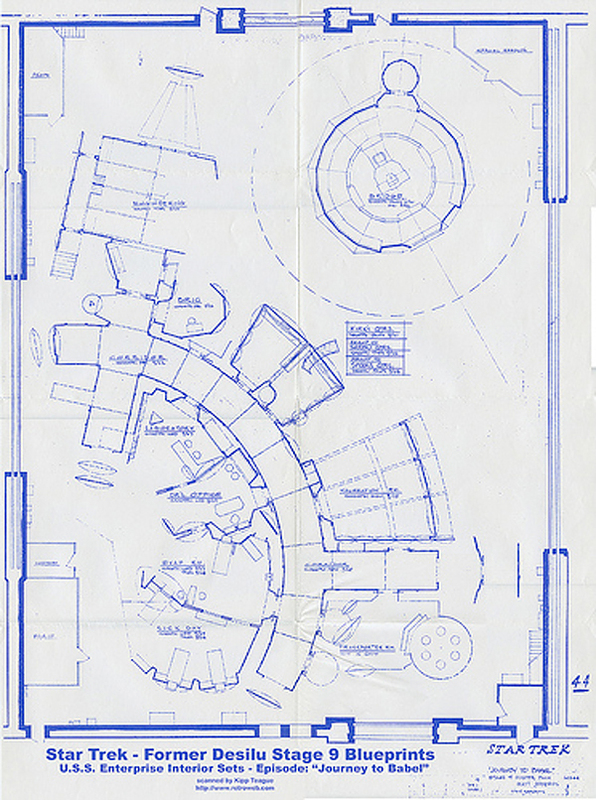 Matt’s exacting blueprints allowed Michael Bednar and the Farragut Films set construction crew to build a USS Enterprise (and USS Farragut) interior nearly identical to what existed fifty years ago in Hollywood. Indeed! In the meantime, other “little touches” abound in Star Trek Continues, some easier to notice than others. For example, it’s pretty obvious that the earliest STC episodes used much of the music and sound effects in the original Star Trek. But what you probably won’t notice unless you look closely is that the blocking of the actors (where they stand in a scene) is purposefully done to mimic what was done 50 years ago, as is the acting style. It’s not just that the actors are doing impressions of Shatner, Nimoy, Kelley, and the rest. They are working very hard to move their bodies, manipulate their facial expressions, and control their vocal delivery to mirror the performances provided back in the 1960s. Modern acting styles can present very different performances that, while still strong and engaging, would not have the same feel as TOS. Likewise are many directing choices, such as cutting to close-up reaction shots with a flourish of incidental music or showing a subtle sideways glance of one character to another. And if that isn’t enough to impress you, there’s two final touches that are added in post-production. First, the colors in each scene are super-saturated to have that over-colorful look of the original Star Trek. And second, because Trek was originally filmed on 35mm film and not video, STC digitally adds in a “graininess” during post-production to make the image look a little less “perfect”…and that, my friends, is what makes it come out so perfect! Next time: our focus on Star Trek Continues…er…continues with more about the actors and the earliest vignettes released to introduce this new fan series. We also begin spotlighting the episodes themselves with a closer look at “Pilgrim of Eternity” and how that production came together. And finally, we learn how much of his own money Vic Mignogna put into the roll out of STC and what happened when they held their first Kickstarter…er, KIRKstarter! 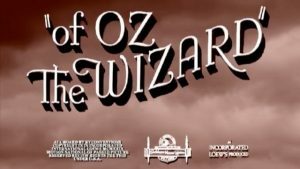 Oh, and since we were talking about Matt Bucy anyway — even though this last item has nothing to do with Star Trek — Matt edited together one of the most mind-blowing head-trips of a video called Of Oz The Wizard . I can’t really describe it, and I’ve only made it through about 54 minutes so far (I’m up to “look”), but I guarantee you’ll want to share it on Facebook! I cannot imagine the amount of work that went into editing this video! I always wondered how the Theatrical acting quality of the cast of Babylon 5 was “missing” something that Star Trek had.. and I think you’ve found the head of the nail. Its not that Trek was Scientifically “accurate” or “engaging”.. at the time most of it was speculative and fantastical.. as much as it was Science Fiction.. it was very emotionally charged. But Trek seemed to roll around in all kinds of recent scientific speculation in service to the story. It was a kind of romper room for young adults or people coming of age, introducing them to all sorts of controversial ideas the conservative grown ups viewed with suspicion… it was a kind of counter culture. But the sets the lighting, it was all theatrical make up.. just good enough to set the stage for a play, garnished with flourishes of cutting edge Special Effects. When Star Trek the Movie and all that came after it were pumping money into Star Trek to make it seem “more real” they were taking away, or re-casting the story in a different mold that was not very much Original Trek.. it lacked the setting.. it was something different. By virture of its limited budget Wrath of Kahn was “closer” to the original because of that limited budget, limited sets, use of physical mixed with digital Matte paintings for backdrops. It looked corny sure.. but in the World of Real Trek.. it was acceptable, okay.. even better than scientifically accurate Apollo Era detailed spacecraft like V’ger.. which was so 70’s. Next Generation was similarly “handicapped” with a limited budget for new set construction, but a higher budget for special fx.. until later in its seasonal run.. in which the stories got better and better because of the lack of resources.. less was more.. the Writers Strike was the best thing ever to happen to them.. withholding the story until the next season opener.. brilliant! Its so wickely odd.. but I think something very important has been stumbled upon here.. Star Trek is at its best when it leaves more to the Imagination.. when it has a tighter budget… when its a limited run. Lucy.. I think for the greater good.. you’d best not Have anymore ‘Explaining to do.. leave it alone. I think you hit on some interesting points there, John. Maybe Star Trek was at its best when the lower budgets forced the stories and acting to “sell” the episode or movie. When you rely too much on fancy VFX, funky costumes and make-up, and elaborately lit sets—when you take away the actors’ ability to actually act by covering their face in unwieldy prosthetics and sticking marbles into their mouths (and making them speak four pages of dialog in a language they never heard before being cast)–when you do all of that, the story itself has the potential to suffer by getting lost in all of the noise and chaos. Oh, and what’s this I hear about Babylon 5 missing something? That show had half the budget of Star Trek, dude. I really didn’t know that about Babylon 5.. those VideoToasters really did great for the time. And isn’t it the same company Will Wheaton went to work for after Next Generation? One thing though that rarely gets paid attention to though is the terrific theatrical scene music.. I’m not speaking of the rip roaring themes.. but the Vulcan tone poems, those striking Crescendos just before Kirk makes a decision or right after. Bones raised eyebrow and the serious or playful little melody. — if those weren’t “over the top” I don’t know what was.. B5 had them too.. but not as strong. I really love how STC reused those familar vibes.. perfectly placing them.. it made my childhood come back in Vivid color. .. Gosh darn it.. I want another episode ! 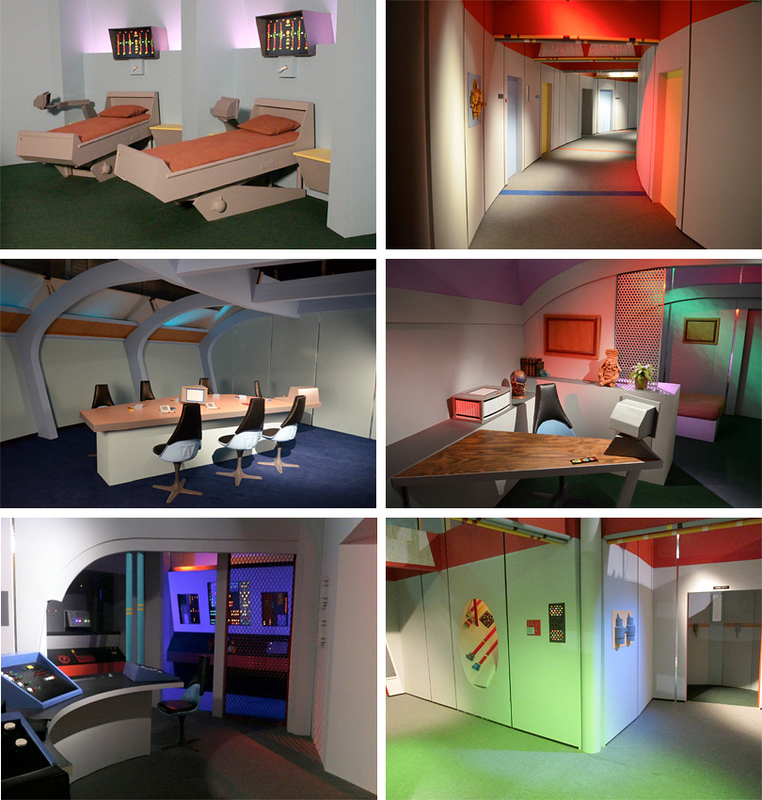 The folks who actually did the VFX for B5–which was the first weekly TV series to use CGI rather than physical models for all of their outer space shots and also for some of their interiors and aliens–was Foundation Imaging…based in Valencia, CA. (Yep, the same Valencia where Axanar Productions built Industry Studios.) Wil Wheaton never worked for Foundation Imagining. Foundation went on to do amazing VFX for the first few seasons of B5 and later worked on DS9 and Voyager, winning an Emmy for the latter. 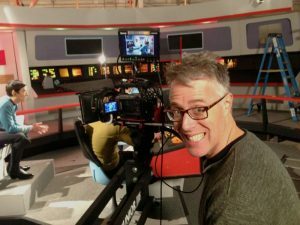 My long-time friend and collaborator on Starship Spotter, Adam “Mojo” Lebowitz, worked both at NewTek and Foundation, and later worked with Gary Hutzel and Doug Drexler on Battlestar Galactica, helping them win an Emmy, as well. Very interesting to a kid from way back here in the sticks though. That all seems to far away.. less real.. than the shows that reached us through the TV. BSG.. didn’t Jamie Bamber (the new Apollo) appear in one of James Cawley’s New Voyages episodes? Funny about Wil Wheaton though.. for some reason.. I guess because Colm Meaney and Michael Dorn showed up on DS9.. I always thought Wesley Crusher would show up on Voyager. Little did I know he wanted a clean break for a while. My early 20 somethings I was thinking ‘Nova chron’ had to be in the Delta Quadrant and Wesley and the Traveler might actually be behind Voyagers winding up there instead of that Cat Paw like invaders from another Galaxy plot device. Somehow Wesley maturing as an individual that might challenge even the powers of the ‘Q’ seemed rational to me.. after rescuing his Mom from the collapsing Warp Bubble Universe.. what he learned from that encounter spoke to a higher order of manipulating reality… maybe even discovering reality was a kind of program running on an alien super computer.. and unmasking the ‘Q’ as mere aliens that were aware of the true nature of reality. .. it dove tails rather nicely with the fate of Professor Moriarity.. and Picards suspicion.. that [all of this] might merely be a program running on a little device in someone elses living room. .. I’ve had too many years to think about Next Gen locked in my solitary mind all alone. Jamie Bamber was in the first episode of Star Trek Continues, “Pilgrim of Eternity.” I discuss the full cast of that fan film more in part 2 and mention Jamie. As for Wesley, it’s kinda funny you should point that out. Harlan Ellison used to say that Gene Roddenberry had only one idea that he kept writing over and over and over and over again: “The Enterprise meets God, and God is a child.” In Wesley’s case, he started off as a child and kind of became God. Interesting, huh? Both STC and New Voyages built amazing TOS sets. “The Enterprise meets God, and God is a child.” In Wesley’s case, he started off as a child and kind of became God. Interesting, huh? Lol.. such is the fate of every Child.. to become their Parents, though as a Child I think we all aspired to that one day.. what little did we know..
Not even with the Big “Booming Voice” ? Any father sufficiently older is indistingushable from a god or his creator. Just ask 10 year old Data. That’s probably what the Kelvins thought.. Kirk begged to differ however. Previous Previous post: STAR TREK CONTINUES releases their 10TH EPISODE: “To Boldly Go, Part 1”! 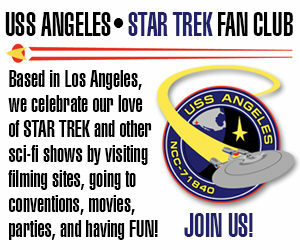 Next Next post: INDIE FILM FESTIVALS are starting to add a NEW category: FAN FILMS!